I’ve been craving egg salad, which is weird because I don’t usually like egg salad (I have this thing against mayonnaise…). 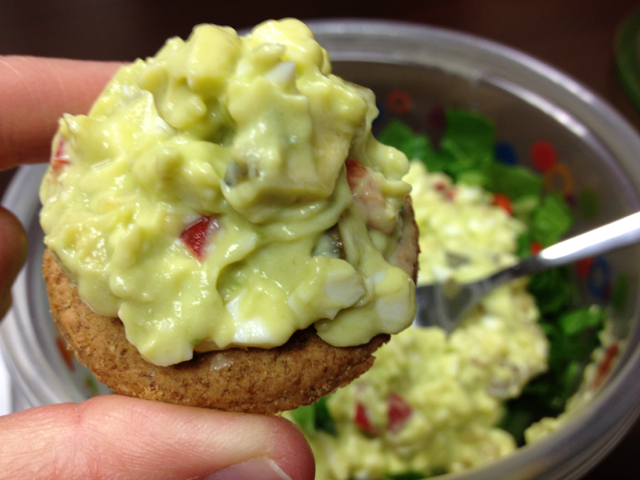 But on a few blogs recently (Closet Cooking and never home maker), I’ve seen recipes for avocado egg salad. Mmmm, now that is something I can get behind. Artie doesn’t like eggs, no matter how they are prepared, so when he was out of town a few weeks ago, I took the plunge and made some egg salad. It actually turned out pretty good! 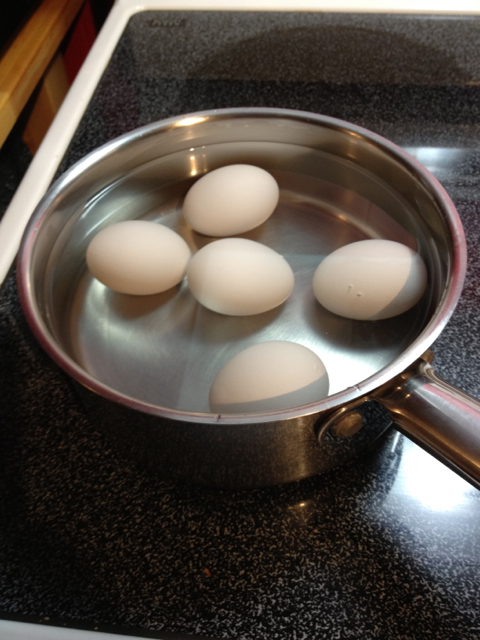 First, I had to google how to hard boil eggs. It’s actually pretty easy (you know, as easy as boiling water). I followed the directions on this website. 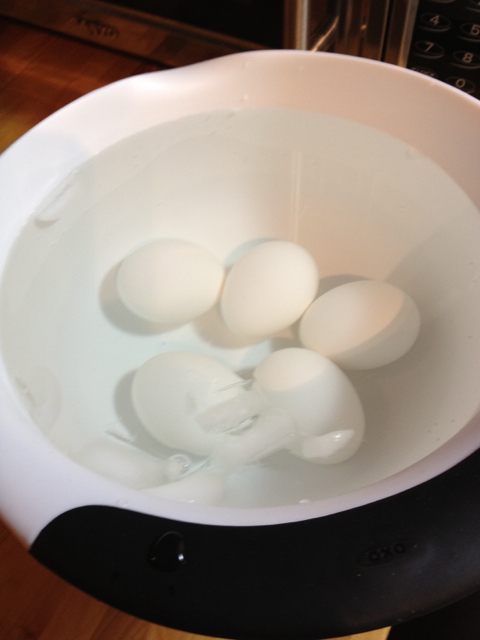 Remove eggs from water with a slotted spoon and place in a bowl of ice water until they are cold enough to handle. Peel, trying not to get shell all over the place. <– Most annoying part, by far. A few handfuls of diced peppers (I like the crunchy texture and I’m not a fan of celery, which is typically added to egg salad). A handful of diced dill pickles (perfect crunchy, briny bite). 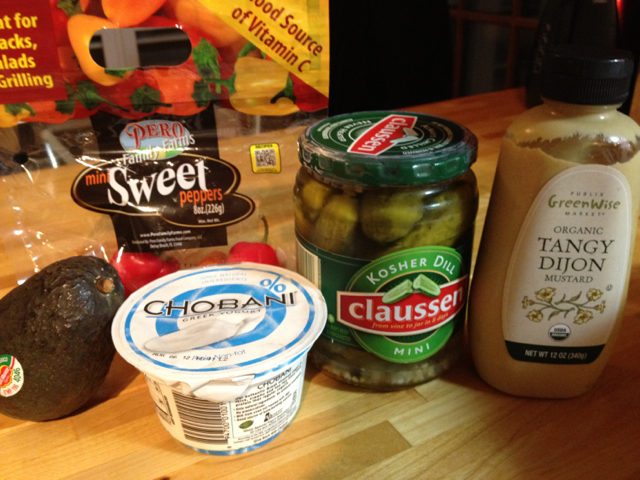 A few dollops of plain, nonfat Greek yogurt (better tasting and better for you than mayo). I ended up not adding any mustard, but I’m sure it would have been tasty if I had. Stir to combine. Add salt and pepper to taste. Don’t worry – I didn’t forget the avocado! At this point, if you are going to save any egg salad for later (like lunch tomorrow), put that in a container in the refrigerator. Because of the avocado’s propensity for enzymatic oxidative browning (yeah food science! 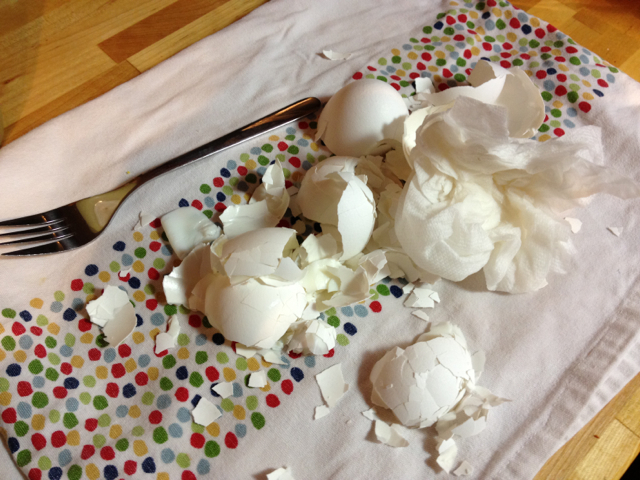 ), it will turn your egg salad a yucky brown color. 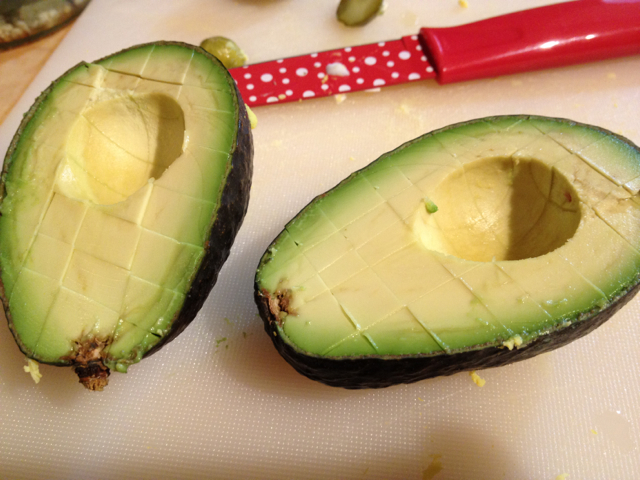 To the portion you are about to eat, add 1/2 of a small avocado (about 2 ounces), diced. Stir until well combined. And that’s it! There are a few options for serving. On a sandwich thin with a few spinach leaves (which is how I ate it the first night I prepared it for dinner). Or on a salad with crackers on the side (which is how I ate it the next day for lunch at work). Just pack the avocado separately and stir it in right before serving. This was excellent – crunchy bits of pepper, creamy egg and Greek yogurt, salty pickles, and buttery avocado. The protein from the eggs and Greek yogurt kept me full. 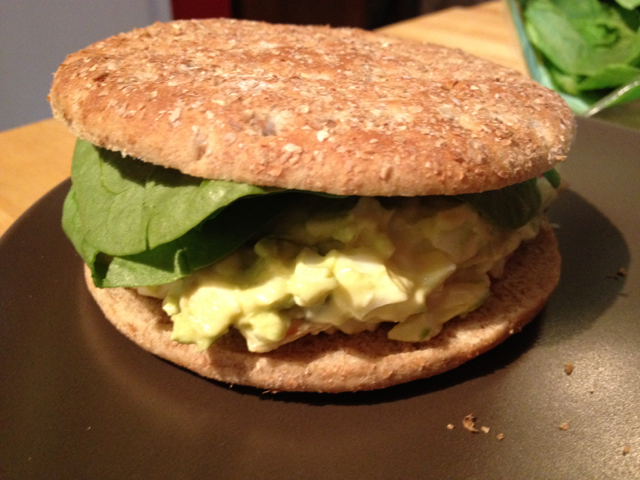 The avocado made egg salad much more palatable to me. 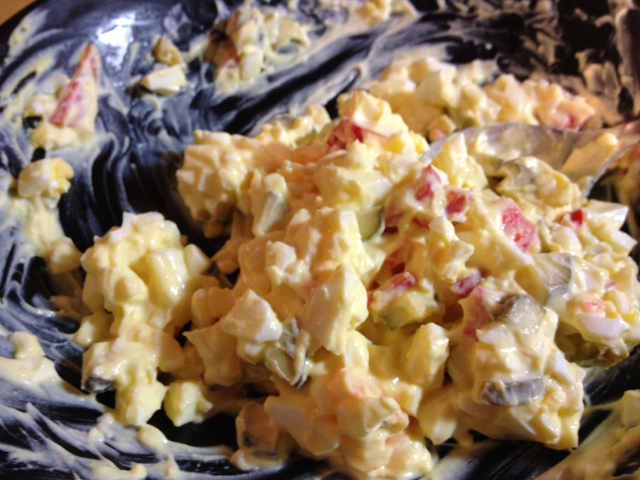 I may never be a fan of traditional egg salad, but this is a recipe I can see myself making again and again.